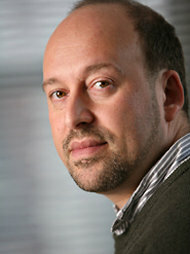 NASA’s Schmidt has been harshly criticized by scientific colleagues in the past: See: Climate Depot Round Up of NASA”s New Lead Global Warming Scientist: In 2009, Atmospheric scientist Dr. Hendrik Tennekes, wrote a scathing denunciation of NASA’s Schmidt in which he said he was “appalled” by Schmidt’s “lack of knowledge." Statement by Marc Morano, publisher of Climate Depot & Former Staff of U.S. Senate Environment & Public Works Committee. 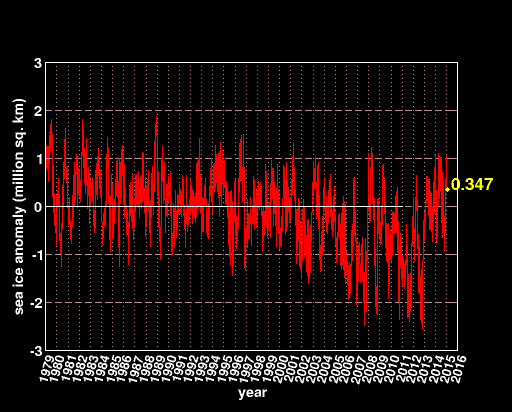 : “The Feds are conning the public on 2014 being the “hottest year”. We now know that both NASA and NOAA (National Oceanic & Atmospheric Administration) knew their ‘hottest year’ claims would not hold up to scientific scrutiny. But both agencies chose instead to loudly push the global warming narrative to a willing and compliant news media. UK Daily Mail: NASA climate scientists: We said 2014 was the warmest year on record… but we’re only 38% sure we were right – ‘NASA press release failed to mention this’ – Nasa’s Goddard Institute for Space Studies claimed its analysis of world temperatures showed ‘2014 was the warmest year on record’ – But it emerged that GISS’s analysis is subject to a margin of error – Nasa admits this means it is far from certain that 2014 set a record at all – The Nasa climate scientists who claimed 2014 set a new record for global warmth last night admitted they were only 38 per cent sure this was true. Yet the Nasa press release failed to mention this, as well as the fact that the alleged ‘record’ amounted to an increase over 2010, the previous ‘warmest year’, of just two-hundredths of a degree – or 0.02C. The margin of error is said by scientists to be approximately 0.1C – several times as much. As a result, GISS’s director Gavin Schmidt has now admitted Nasa thinks the likelihood that 2014 was the warmest year since 1880 is just 38 per cent. However, when asked by this newspaper whether he regretted that the news release did not mention this, he did not respond. Oops. 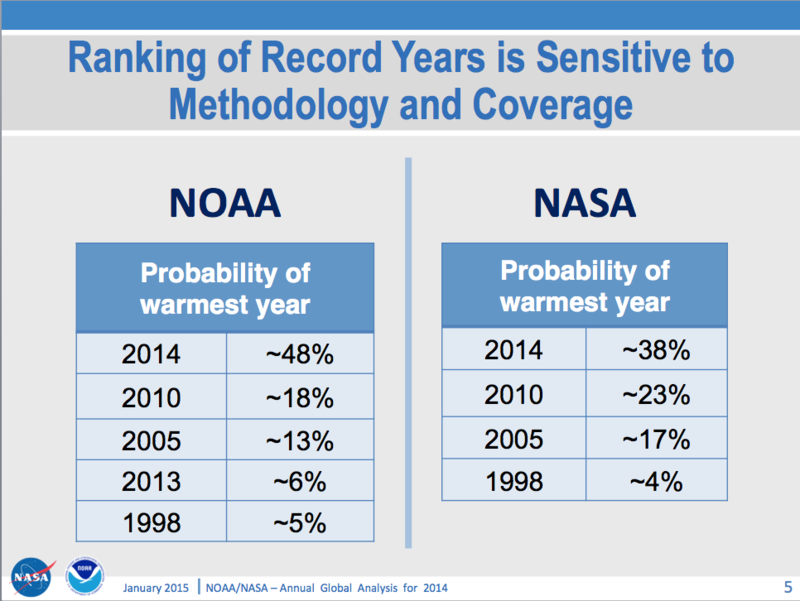 NOAA (quietly) admits 2014 was ‘more unlikely than likely’ the warmest on record – According to NOAA definitions, global surface temperatures for 2014 were “More Unlikely Than Likely” the highest on record, but they failed to note that on the main page of their State of the Climate report…NOAA has once again shown it is a political entity, not a scientific one. And that’s a damn shame. The public needs openness from NOAA about climate; we do not need to be misled by politically motivated misdirection and misinformation. Climatologist Dr. Tim Ball accuses NASA’s Gavin Schmidt of ‘climate deception.’ – “Schmidt knows, after all his years with participating in the creation and naming of the RealClimate.org web site, that it is all about the headline,” Ball wrote via email on January 18.- “Schmidt has achieved that, and all the pointing out of errors and deceptions will not alter the impression left with the media and the public. As it is said, the lie is twice round the world before the truth even has its boots on,” Ball wrote. “Schmidt has taken on the [retired NASA scientist) James Hansen mantle with vigor and purpose and the climate deception continues,” Ball concluded. UK Met Office Say Surface Temperatures Should Agree With Satellites — ‘Except when they’re not! !’ – ‘In 2013, the Met Office had this to say about global temperature datasets: “Changes in temperature observed in surface data records are corroborated by records of temperatures in the troposphere recorded by satellites” Well, except when they’re not!! Q. If Surface Air Temperatures cannot be measured, how are SAT maps created?